I am back from an epic 5-day, fifteen-mile solo hike on the Appalachian Trail. That is correct: I made about 3 miles a day. Damned impressive, I know. I consider this an accomplishment–and here is why: along the way I looked at everything that interested me. I stopped to read a chapter in my book whenever I felt like it. I did not tear up my feet. I camped in pockets of beauty well off the beaten path. I felt at home in the woods. Five days after my return, a friend asked me if I’d heard about the forest fire on the Appalachian Trail in Connecticut. Wasn’t that where I’d been hiking? Photo taken by Joseph Meehan at 5:45 a.m. on Tuesday May 10. The flames were extinguished by early afternoon. 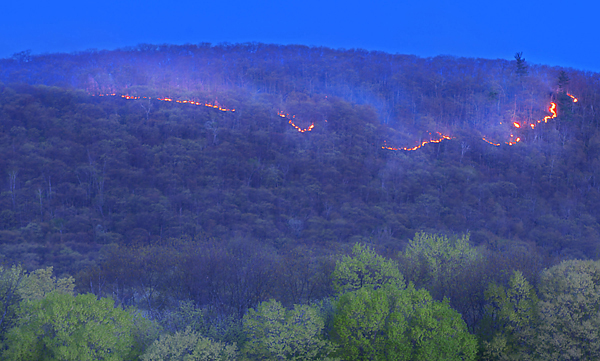 A quick search brought up the Channel 8 news story: a fire on the mountain north of Salisbury CT burned for two days. Fire fighters from nine surrounding towns brought it under control. 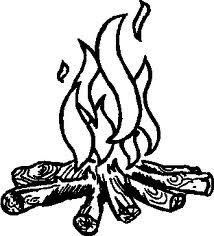 The blaze was traced to an illegal campfire. I was filled with dread. Several days earlier, I’d had a campfire up there. Time stopped until I was able to get a fix on exactly where the fire had been. Hikers who know the area had been posting on WhiteBlaze.net. They were calling it a brush fire. It scorched 73 acres of forest floor and brush, but it was not hot enough to burn mature trees. 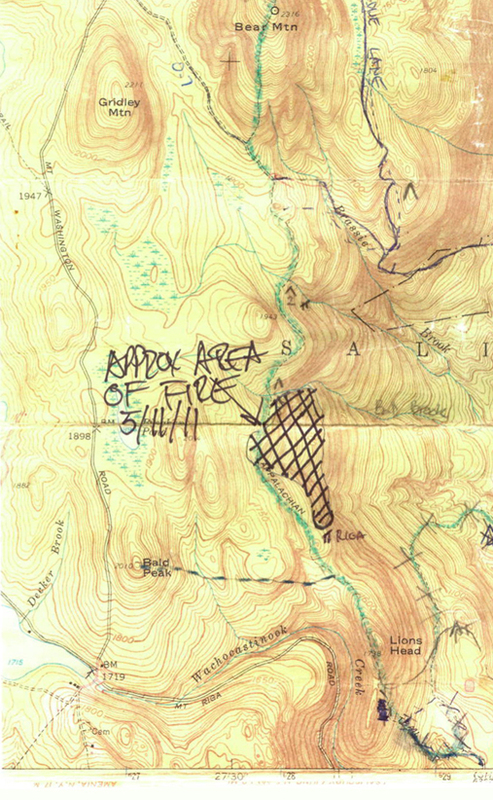 A day later, one hiker put together a map of the burn perimeter. The fire started at the Ball Brook campsite, more than a mile from where I camped. The campfires I make are what hikers call a twig fire–just large enough to boil water for dinner and tea. You don’t burn wood much thicker than your thumb. You do not drag over tree limbs. No cutting is involved. 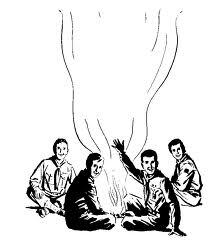 But yes, because a campfire is the soul of camping, you feed it sticks til you go to sleep. It burns to fine ash. When you break camp the next morning, you drown the fire. You make the ground a saturated soup. Then you scoop up the ashes (clean carbon) and scatter them over a wide area. A hot spot can survive in a buried root, smolder underground and flare up days later. I know this, and my fear was that I might have somehow been over-confident when I “left no trace” at my campsite below Bear Mountain. As Boy Scouts we would always “police the campsite.” It was at Outward Bound in Colorado, as both a student and a sherpa, that I learned the “leave no trace” ethic. It is a kind of skill game: you camp in a place where no one has before you, and you leave it as if you had never been there. You camoflage the ground that you cleared for your tent and sleeping bag. There is no trace of the fire you made. You rake back sticks & stones, and sprinkle leaves here and there. Like an artist composing a landscape painting, you stand back and judge the full effect. It is as if you were never there. This is a game my daughter particularly loved on our trips into the White Mountains. After crossing over into Massachusetts at Sages Ravine, I met up with two hikers, Don Hagstrom and Bill Heath, out for a quick overnight. They are senior to me by a few years and, in Don’s case, a few thousand miles hiked. He’s active with the Green Mountain Club, leads hikes in all seasons, and logs 600+ miles a year. It was an easy decision to camp with them that night at the designated Laurel Ridge site: tent platforms, a moldering privy and a steel “bear box” to protect our food overnight. I boiled my cook water on Bill’s primus stove, and after dinner we walked over to Bear Rock Falls to watch the evening shadows swallow the Housatonic Valley (“Better than TV” says Don). We spotted a huge porcupine (nature’s fat man) as it waddled unhurriedly away from us. The silver-slipper of moon was setting, and a pair of owls put on a noisy mating display on the ridge above us. A fantabulous night for a moondance. We talked for a while sitting on our tent platforms. There is a fire ring in front of us, but the rules are posted: No open fires, and we abide. It is early May, and several groups have already signed the campsite logbook. At this rate, the surrounding woods would soon be stripped and abused of every burnable branch. And yet, the existential question: What is camping without a campfire? Of the thirteen states through which the Appalachian Trail passes, Connecticut is the only one that does not allow open fires anywhere. Adam Brown of the Appalachian Trail Conservancy told me that it was a condition set by the property owners who sold or granted easements to their land. Nonetheless, during my five-day trek, I came upon several old campsites. Un-doing them is always part of my mission: I dismantle the circle of blackened rocks, disperse charcoal and blackened tree limbs, pack out trash. Cans, tin foil and plastic bottles mostly. Who wants to see any of that after a day’s hike? Through the years the number of hikers has grown with the population. A good thing; but the impact along popular trails can be extensive, and so the kind of rules that prevail at picnic grounds reach further and further into the woods. It is of course the classic tension between freedom and responsibility. It is human nature. In 1994, Leave No Trace was founded in Boulder, CO. The organization fosters outdoor ethics and environmental stewardship through a remarkable outreach & awareness program. But of all the transgressions we might commit in the wild, none is more destructive than causing a forest fire (even given the ecological benefits of natural fires). Every tree stores about half its weight in carbon, and protecting forests and replanting trees is probably the most effective strategy of all for reducing green house gases in the atmosphere. And yet…and yet…the experience of sitting around a campfire is primal and soul-restoring. It is our connection to deep time, the instant of creation and s’mores. There must always be a place for it. And isn’t it even more important now that the electronic fire in our hand is so seductive? The “Salisbury fire” photo by Joseph Meehan is used with permission. Visit his website to see his astonishing portfolio. A fascinating article about the anthropology of campfires is in this issue of Smithsonian Magazine. This entry was posted in Climate change + Culture, Deep Ecology, John Wackman blog and tagged Appalachian Trail, camp fires, carbon sequestration, Dwarf Pitch Pines, environmental stewardship, forest fires, Leave No Trace, outdoor ethics, Salisbury CT forest fire. Bookmark the permalink. Great piece, John. Sometimes there’s nothing better than a few days on your own in the woods. Really liked the way you connected our current fascination with lighted, hand-held devices to our ancient connection to the comforts and transcendent aspects of staring into a fire. It’s difficult for me to imagine spending significant time in the woods without a fire–it’s certainly one of the pleasures. Thanks for sharing your experience with us–I feel enriched today from having read it as you returned me to my own experiences backpacking.